Preheat oven to 175°C/350°F. Line a baking sheet with one sheet of aluminum foil, drizzle the sheet with olive oil, and place salmon fillets on top. 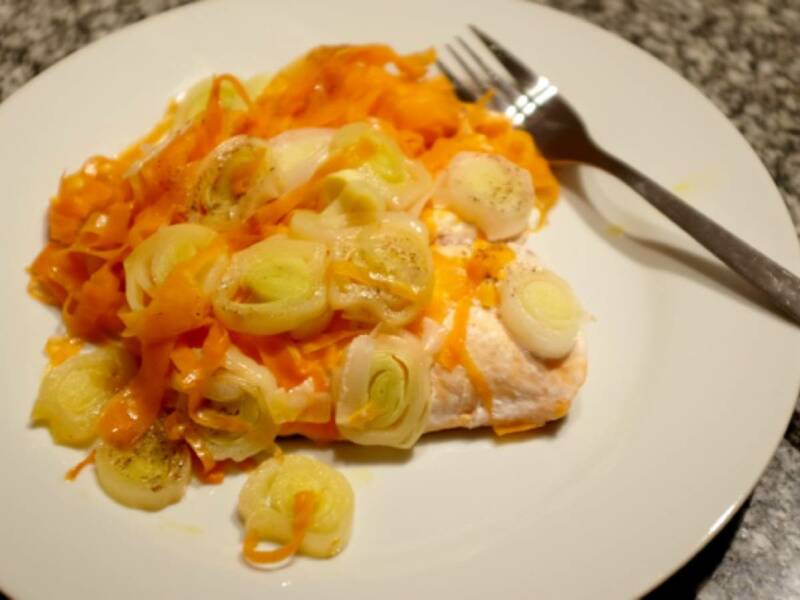 Peel carrots into strips, cut leeks into thin rings, and add on top of the salmon fillets. Season with lemon juice and salt and pepper to taste. Place another sheet of aluminum foil on top. Fold up the edges of the aluminum foil to create a package and seal the edges well. Transfer baking sheet to oven and bake for approx. 25 min. at 175°C/350°F. Remove from oven and carefully open the aluminum foil package. Transfer to a serving plate and enjoy!